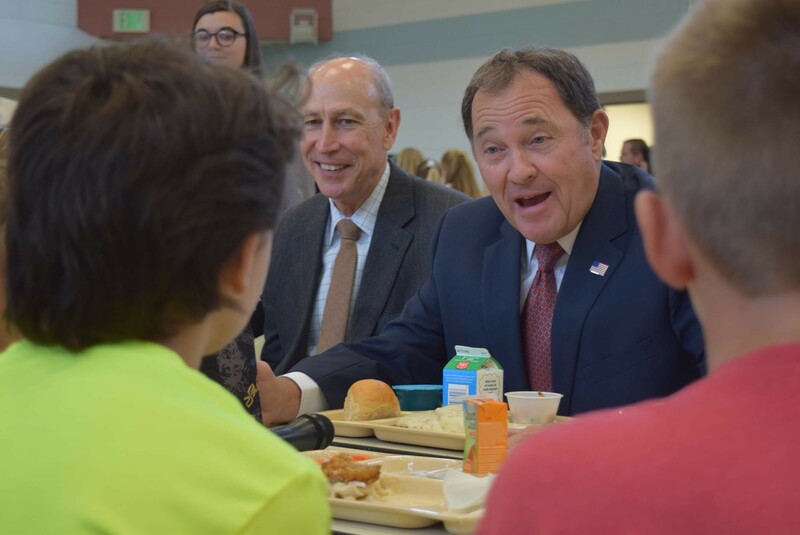 Utah’s governor, alongside students and administrators, talks about school safety and mental health. Utah’s head of state took a seat at the kid’s table on Wednesday. As part of an effort to improve school safety, Gov. 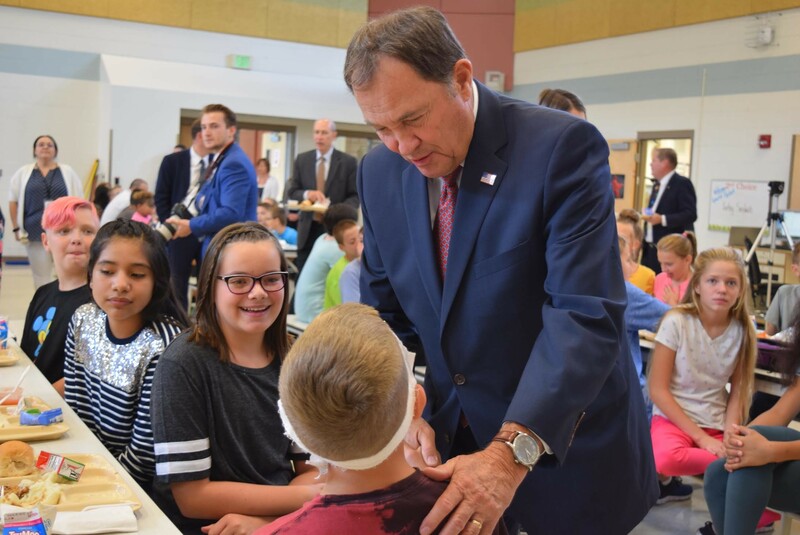 Gary Herbert visited with fifth- and sixth-grade students at Rose Springs Elementary School in Stansbury Park and spoke with school counselors and board members about what they need to provide healthy and secure learning environments. School officials demonstrated how physically safe they can make the building. Standing in the foyer at Rose Springs, Herbert, joined by fellow Republicans, Reps. Steve Eliason and Merrill Nelson, were quickly trapped in the entrance unable to reach other parts of the school. Two doors, or solid steel curtains, slid shut in a matter of seconds. The high-tech doors are just the rural school’s latest attempt to prevent school shooters or other intruders. “That’s pretty impressive,” Herbert remarked. Then, someone yelled, “All clear,” and a school administrator used a keycard to open the doors. Things were back to normal and the large sliding doors were tucked away inside the hallways. Herbert said state and local school districts are trying to be proactive to prevent shootings that have ravaged schools this year in Texas and Florida. Rose Springs recently had 15 sliding doors placed throughout the building that close when officials declare a lockdown. The doors divide the school into three zones meant to keep a potential shooter or other intruder from reaching other parts of the building. The school is one of the first to have the doors—which close as fast as two feet per second—installed in the state. Before the governor spoke with administrators, he sat down for lunch alongside some 150 students. On the menu: chicken-fried steak and mashed potatoes, a carton of milk and a serving of vegetables—just what the kids ate. For a few minutes, Herbert, Eliason and Nelson chatted with the kids at their table about their day at school and what chores they had later at home. Lunchroom talk. Along with the safety demonstration, Herbert’s visit was also meant to cover aspects of mental health in schools and counseling. Thanks to a bill signed this year by Herbert and sponsored by Eliason in the House, the district was able to hire more counselors to help address student well-being. The district now has one dedicated counselor for about every two schools in addition to the other advisers and staff at each school. Anne Colunga, an elementary counselor in the Tooele district, said not only is part of her job to make in-home visits with students and their families that need help, they also have a homeless liaison that can help. Colunga said they also sometimes have to set up showers at the school so the kids can bathe or help them do their laundry. What might help, she and others agreed, is more staff. Before Herbert left, he encouraged those in the crowd to support Question 1 on November’s ballot. The measure would create a 10-cent raise on the gasoline tax to go toward the state’s education funds—something that might help address issues like the ones like Colunga raised.